Here are some lake fishing tips and techniques for the beginner. 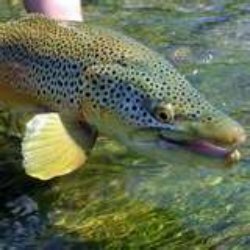 When fishing a lake or pond the beginning fly fisherman needs to understand the basic needs for fish to survive. 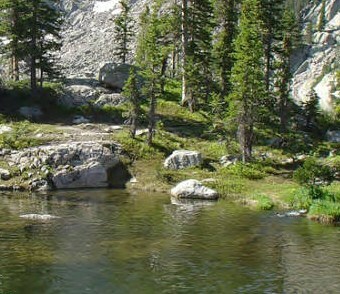 There are 3 things that trout need regardless if what type of water they are in, and they are food, shelter and oxygen. That is all pretty obvious stuff since it is the same thing that we all need. When it comes to food there are a few ways fish get their food. Fish feed on the insect population in the water so here are things to look for. The first way is by feeding near the banks where insects could fall into the water from a tree, bush or weeds. This is one of their favorite places to feed especially when it is grasshopper season and they fall to the water and cannot get out. Look for heads rising near the banks and cast to them. If there aren’t any rising fish you should still cast towards the bank in the areas described above. Another way that they get food is from the vegetation and rocks that are below the surface. Since the sun will penetrate a short distance below the water surface, the shallow areas of a stream may have vegetation. Bugs live here and they complete part of their life cycle below the water. Some bugs cling to the rocks until they head for the water surface and break out their wings. 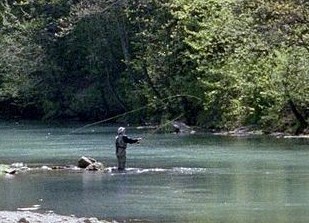 Shallow areas are a good place to fish with nymphs. The fish must always protect themselves from other predators besides us fisherman. They have to watch out for birds and other animals that feed along the banks. Fish will look to deep water, logs, and brush and undercut banks to reduce the chance of being seen. These are all good spots to cast a fly. This is where a river and lake are different. There is no current on a lake so a fish has to move around more to get oxygen through its gills. In a river a fish could spend all day within a 50 square foot area and survive. 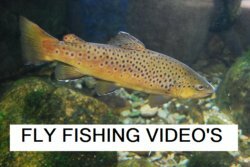 In a lake or pond the fish are always moving around, and they are usually doing it fairly close to the banks or in deep water. You should concentrate your pond fishing efforts near the shore. Any shallow water where you can see the weeds under water would also hold fish since there is food. If there were a stream or creek flowing in or out of the lake this would be a great place to fish also since the water would be moving food and oxygen. Underneath trees is another good spot because it will provide shade and falling insects to the water below. The best time to fish this type of water would be in the early evening to late evening hours. The fish are always seeking cover from prey so they will sit in the deeper waters during the day, and come up to feed at night when they are not as easy to spot. The other reason that this is a good time is because many hatches occur in the early evening hours. The more brightly the moon is shining the better the fishing will be at night and the worse it will be the next afternoon. Because the light helps the fish see the insects they will eat all they can at night and not be as hungry the next day. The best way to fish a pond or lake is not from the shore. If the water is shallow enough to wade out 30-50 feet you can walk out there and cast towards the shore. Usually the water will get deeper as you go out further so you may consider a float tube ($75 and up) or water skeeter ($250 and up). Both of these options would get you to a good casting location. 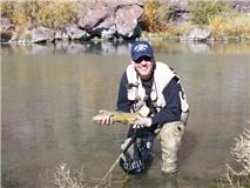 Once you are in a good casting location you should have success with dry flies when fish are rising in the evening. Since the fly should remain almost motionless on top of the water a longer leader will give you a better presentation. The fish have a lot of time to consider your offer so you want to make it a good one. Nymphs will work casting towards the shore, around the weed beds, and underneath trees at night or during the day. You may even have some luck stripping in a streamer. You need to give them something they are use to seeing so you may want to talk to the local fly shop to see what works in that area. 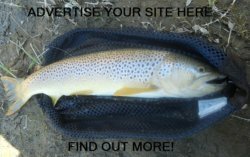 Leave fly fishing a lake or pond and return to beginner page.